Magnetic buttons from steel pony are a unique, stylish, and functional way to dress up any outfit. Use them as a pin, or through a button hole on your favorite cardigan. 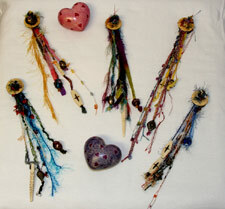 Each piece is beautifully handmade in The United States of carved bone, recycled silk, and unique accent beads. These are sure to draw compliments! 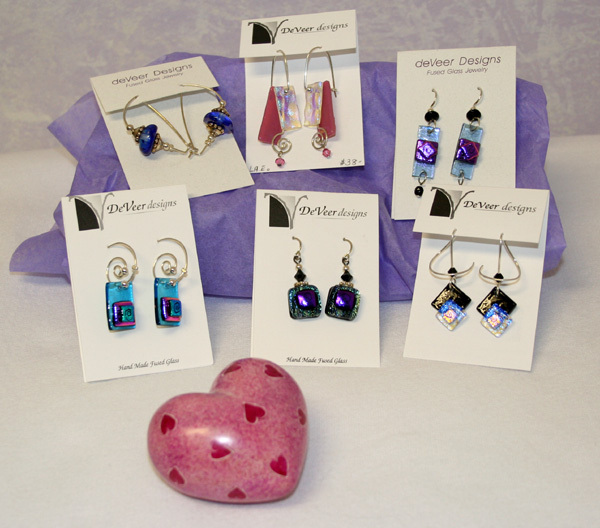 Deveer is a super fun, eye catching, and unique jewelry line handcrafted with fused glass, crystals, and sterling silver. To add to their uniqueness, the designs are inspired by the ancient Chinese art of Feng Shui. The colors and symbols are specifically chosen to enhance one of the eight important areas of life. So whether you see these beautiful earrings as practical, or just for fun, they are sure to be one of your favorite pairs! Treska is one of our most sought after lines of jewelry because of its distinct flair, and the way it just screams; "Lets Have Some Fun!!!!". Treska offers Necklaces, Earrings, Bracelets, Watches, and Anklets with gorgeous, versatile colors and textures that are sure to match any outfit in your closet!! The unique "Coil" Necklace is a favorite with its easy and fun wrap around style! Come to the shop and try one on!! 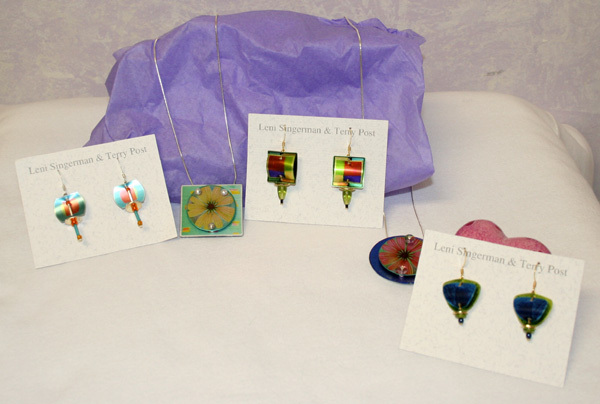 Singerman & Post is an exciting line of jewelry with a style all its own. Each piece is handcrafted with and original process using laminated mylar, film and thin plastics. The images on each piece is a photo transfer of a unique original piece of artwork. A pair of earrings or a necklace is sure to invite oodles of compliments!! Susan Packard is the designer and creator of her exquisite jewelry line. Each piece is meticulously handcrafted to ensure the wearer a truly beautiful piece of jewelry. 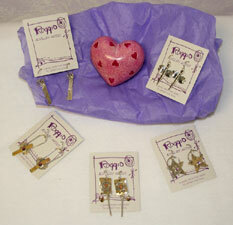 Sterling silver, gold fill, handmade foils, and brass are just a handful of mediums she uses to create her works of art. Inspired by nature, her earrings, necklaces and pins are sure to delight!! 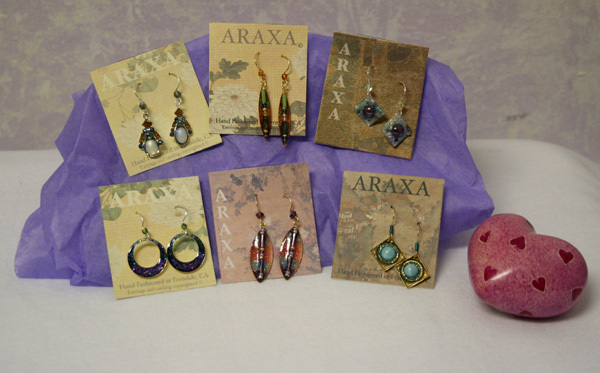 Araxa Earrings are handcrafted in Ferndale, CA. They are one of our newest lines and we love them!! They are super fun, with a dash of sparkle! We carry a huge selection of fine sterling silver and gemstone jewelry! Here is just a small handful of what we have in the store! We carry your favorites, such as turquoise, Amber, Jade, Lapis, onyx, and much, much more!! Including some super rare gemstones too!! Roggio is a truly unique line of fine handcrafted sterling silver jewelry. Each piece is made with the utmost care and passion, to bring you outstanding pieces that are not even a bit ordinary! We love this line, and we know you will too!!! 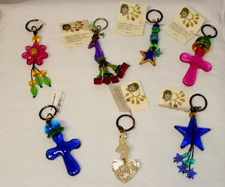 Lalo Orna by African Express offers Amazingly unique jewelry, key chains, and home products. The entire collections consists of hand-crafted pieces designed by Lalo, she later takes her designs to the local villages surrounding the factory and teaches the local women, young and old to assemble the pieces by that further empowering and creating. Her pieces carry with them all the intentions of everyone who touches them. Our company produces a wide range of original unique home decor, table top and fashion accessories, all are free-flowing forms in a broad range of color and materials. Each piece is created in Bulgaria through a women's co-op where there is fair pay and good working conditions! Moonbabies are a collection of whimsical handmade bead and wire products that are manufactured in The United States by "MoonMoms". 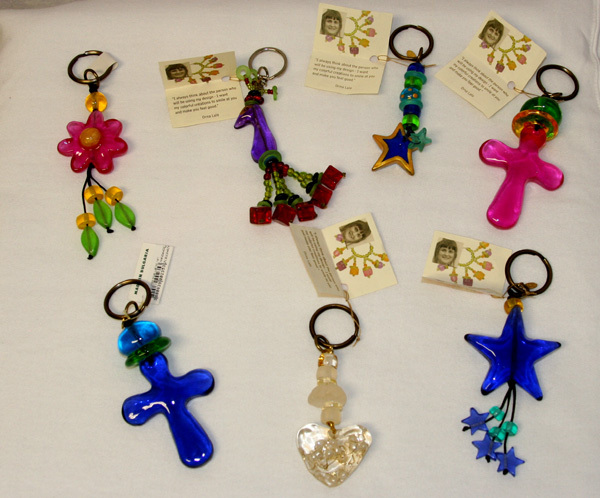 The company gives a portion of proceeds to "Anonymous Angels", a foundation dedicated to helping children in need. 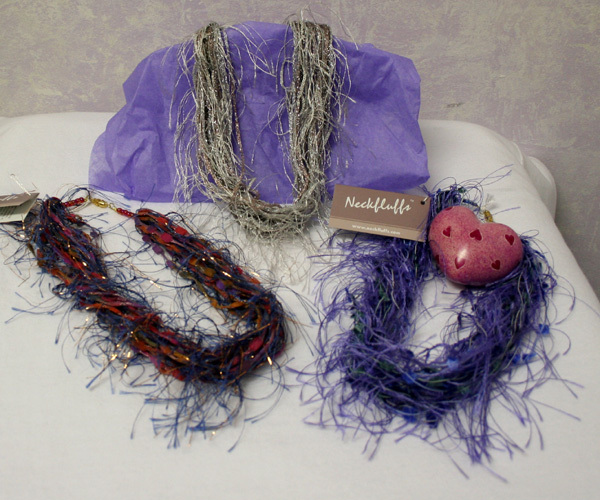 They offer high quality products such as pins, necklaces, lanyards, eyeglass holders, and anklets. 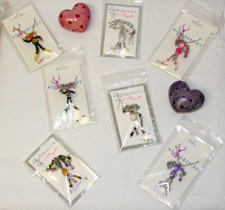 They make great gifts for children, adults and teachers!! Must we say more? Neckfluffs are 100% fun and yet they ooze with sophistication. Even our most "conservative" customers love them, and often buy two at a time!! We have a large assortment of colors, so come take a peak!! 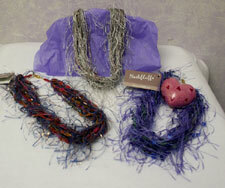 Hugo offers beautiful jewelry and accessories in the hottest new colors and styles. The designs they offer can be worn throughout the workday, and spice up your evening attire as well!